I need help explaining this aerial photograph from the Fullerton Public Library. John Kent? John Robson? Tim Twombly? Others? For the rest of you, Ludd is a former engineer and graduate of Harvey Mudd College, ’71. He’s possibly the most experienced outdoorsman and hiker from SHHS in the ‘60s. Since 1967, he has hiked incessantly from one end of the Lewis & Clark Trail to the other. He also knows John Muir personally. This is all way before my Fullerton time so I cannot find a landmark or contribute. However, the picture and Paul’s historical notes are very interesting. 100 years of massive change and growth in the Land of Paradise. Thank you. I enjoyed the view and the read. 1. I’m assuming this map is on a north-south axis. 2. By 1923, Fullerton was a growing oil, railroad and agricultural town, especially agriculture: citrus fruit. 3. 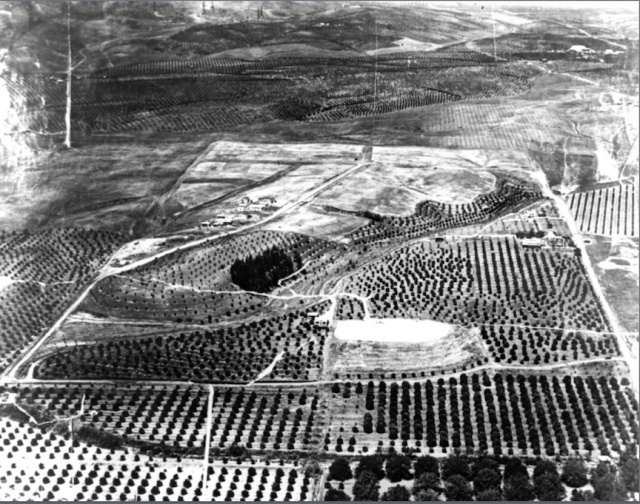 Although Citrus Blight had affected most orange groves in the county and elsewhere, the citrus industry was strong. 4. The Bastanchury Ranch was operating, and would not be sold until about 1933. 5. Valencia Mesa would not be platted and sold as lots until 1940, but there may have been a road there. 6. If so, that road would be the northern terminus of the Golden Hill neighborhood, below Bastanchury Ranch to the north. 7. The Bastanchury Company headquarters was located at that level, where St. Jude Hospital was later built in 1958. The packing house was located where Ranchtown was, with a spur line descending south by Spadra (later Harbor), crossing Spadra at about Berkeley and continuing south by southeast by the east side of Wilshire School to end at the packing house on Commonwealth. 8. The prosperous townspeople then lived largely on the streets to the left (west) of Spadra between Commonwealth and north to Malvern, and I thought north to Valley View, in homes here and there on the hill. I don’t see those hillside homes on this map, however. These doctors, lawyers, judges, dentists, store owners, businessmen and others also lived on ranches around town, from Cypress Avenue (later State College) in the west to at least Orangethorpe and around where West was built later, the Gardiner home. They also lived east of Hillcrest Park in the hills and down to Chapman. 9. Now if Bastanchury Ranch is shown above (north of) Golden Hill in this map -- as it surely is -- I would expect to see details, including the packinghouse and the headquarters, some of the wells and maybe small areas where the workers lived. 10. If the north-south road at the left on our map is Nicholas (later Euclid), it would end no farther than where Valencia Mesa was built 17 years later. 11. That road could possibly be Gilbert. If that’s the case, this map shows much more than Golden Hill, namely the Fern Drive neighborhood and the future Hughes Aircraft area. 12. Instead, the short north-south road about 1/3 of the way from the left side could be Nicholas. In that case, the whiter area to the right of whereto the short road ends and above could be the packinghouse and headquarters. 13. I think #12 is accurate, Golden Hills is below, yet not developed as a residential area yet above Fern Drive or a little lower. 14. If #13 is accurate, the #8 problem of no visible houses may be solved. 15. On the other hand, the #14 conclusion does not include Spadra north, which may not have reached as far north as where Valencia Mesa was later built, by 1923. 16. In addition, I may be wrong above! The Valencia Mesa type road may be further north, beginning at the dark area of trees and continuing in a northwest diagonal. 17. I’ll stop now because I don’t know.